ATTENTION! To access the content of the add-on, you must have the game PLAYERUNKNOWN'S BATTLEGROUND activated. 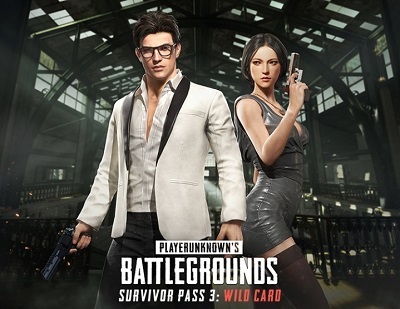 It's time to add a bit of style to the battlefields, with the help of "Survivor's Ticket: Wild Card!" You will look great regardless of whether you are dressed in a nice and fashionable modern outfit, if you are wearing a needle or cocktail dress straight from spy movie - you only need to raise the level of your ticket! Unlock skins for weapons with the help of new missions, challenges! Survivor's Ticket missions are specifically designed to help you develop your skills, and the survivor's experience gained for them will allow you to unlock new rewards. With new missions for beginners and improved daily and weekly missions, earning experience and rewards has become even easier! In addition, you can get unique skins for weapons by completing special tasks for these weapons! NEW LEVEL: reward for every level earned! With "Survivor Ticket: Wild Card" you will receive new rewards with each level. You will have 10 weeks to complete all the missions, but players who want to save time can purchase upgrade packages at 5, 20 or 30 levels in a game store. OPEN REWARDS: over 60 new items! Dress for killing with more than 60 new items you can earn by raising your level of "Survivor Ticket"! Become a clever spy with a tuxedo outfit and cocktail dress, show your wild side with the Snow Leopard - M249 skin, and don't forget to open 20 unique weapon skins in new challenge missions for weapons!